We are absolutely delighted to report that The Found Generation and some of our key reports and policy proposals were cited with approval this week in a Westminster Hall debate in the UK Parliament, held on Tuesday 27 October 2015. “I want to lead a positive and constructive debate using recent research into the role of the Department for Work and Pensions, specifically jobcentres, in supporting young people to find long-term employment“. In particular, Chloe focused on recent research and proposals from two organisations working with young people: YMCA England and The Found Generation. Praising us as an “extremely practical group that asks young people for their own solutions to the problem of young unemployment”, Chloe made reference to our two major reports – last year’s report on Practical Solutions to UK Youth Unemployment and our pre-election Manifesto on Youth Employment – as well as making the Government and MPs aware of some of our specific policy proposals. We were also very pleased to see a mention for our friends at Youth Employment UK for their Youth Friendly Charter programme and their work as the secretariat of the APPG on Youth Employment. “a cross-government youth employment unit or agency in the UK Government, headed by a Minister for Youth Employment”. The debate can be read in full here or here. Chloe also very kindly cited our work in an article for PoliticsHome.com in advance of the debate, which can be found here. 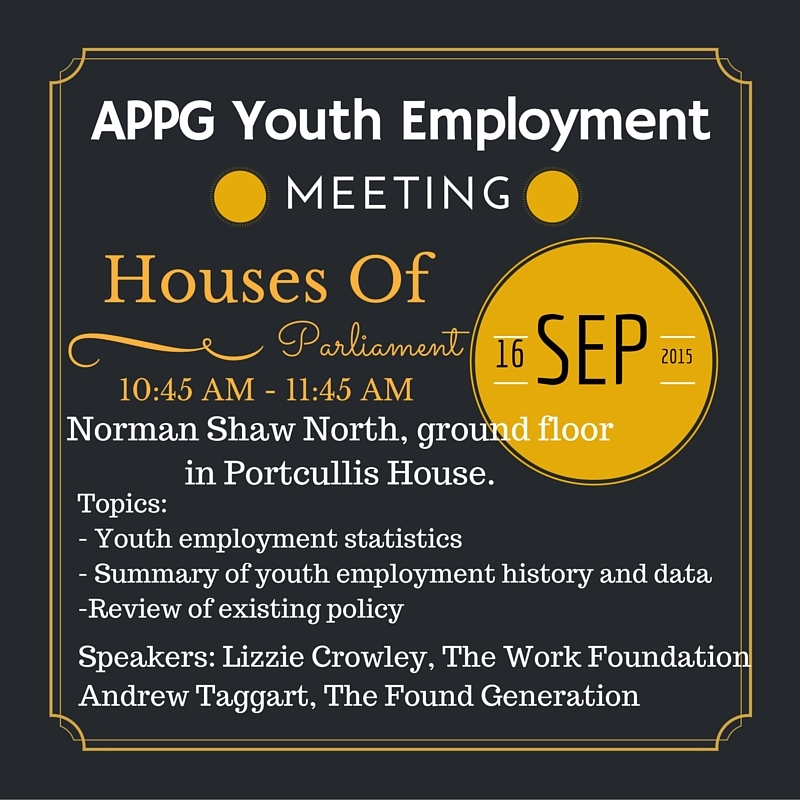 We are delighted to announce that we have been invited to address a meeting of the All Party Parliamentary Group on Youth Employment, a cross-party group of MPs and Lords, in the Houses of Parliament on Wednesday 16th September 2015. We will be addressing the APPG on their first meeting since Parliament returned from the summer recess, talking to them about our policy ideas, giving them an overview of the current situation with regard to youth unemployment and how those policies are coordinated and implemented. We will be speaking alongside a representative from the highly respected Work Foundation. This is very good news for the campaign and further establishes that we are now a respected authority on the subject of youth unemployment in the UK. It also gives us a unique chance to represent the views of young people to decision-makers and to help guide the course of the APPG’s work on youth unemployment over the next months and years by setting out our views at the beginning of their programme of work. We are also very pleased to confirm that The Found Generation has been confirmed as an Associate Member of the APPG and that our Campaign Manager, Andrew, has been named as a member of the APPG’s Advisory Panel – further establishing our credentials in this regard. More information can be found at the APPG website. We at The Found Generation have campaigned since we were set up in 2012 for the creation of an All-Party Parliamentary Group (APPG) on Youth Employment. The idea was that this cross party forum of MPs and Lords in the UK Parliament would provide a vital voice in Parliament and to the Government of the day on the critical issue of youth unemployment and would have a serious influence on policy. We hoped in particular that this APPG would take a lead from successful groups like the APPG on Financial Education for Young People (supported by the Personal Finance Education Group, or pfeg) which successfully campaigned for Financial Education to be included in the National Curriculum by the Coalition Government. Ideally it would also have a secretariat – a body providing support and advice to the APPG – which could help the APPG fulfill its goals, particularly by bringing in young people and providing them with a voice in Parliament. Although an APPG on this subject was finally set up before the last election, proving that our campaign was a worthwhile and necessary one, it initially proved to be ineffective despite our best efforts to advise and support the group. We are therefore delighted to announce that the APPG on Youth Employment (re-named from the previous APPG on Youth Unemployment) has been relaunched after the 2015 election, with a new Chair – the fantastic Chloe Smith, MP for Norwich North. We are just as delighted to report that our friends at Youth Employment UK, who we actively partner with and work with on their Advisory Board, have been appointed as the first secretariat of the group. This means that there is an active, cross-party, group of experts and campaigners on the subject who will be supporting and helping the APPG. Critically, there will also be significant potential for young people to be involved in the APPG’s work, including through YEUK’s Youth Ambassador programme and through The Found Generation. This is something we have hoped for since the beginning of our campaign. With that in mind, we can also announce that The Found Generation will be playing a leading role in assisting YEUK on its work as secretariat of the APPG, in recognition of our close work with YEUK and our extensive campaigning and lobbying on the issue. 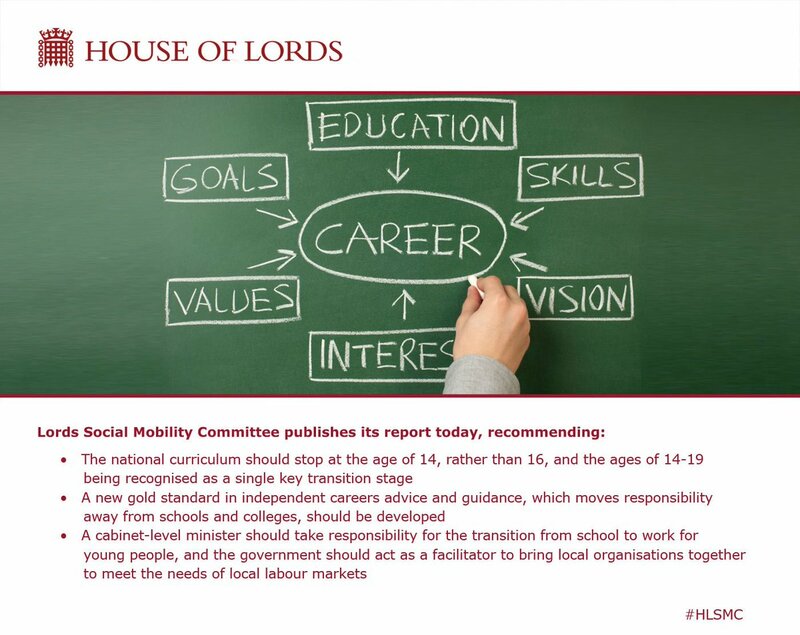 We will be advising and supporting YEUK on this initiative and helping to ensure that MPs and Lords listen to the voice of young people, including pushing the Government to implement policies such as those suggested in our youth-led Manifesto for Youth Employment (we are particularly pleased to see that this is on the APPG’s list of background reading). You can find out more from the YEUK website, or the new APPG website.